We're proud to present you ported version of ScummVM for PlayBook. ScummVM is a reimplementation of the part of the software used to interpret the scripting languages such games used to describe the game world rather than emulating the hardware the games ran on; as such, ScummVM allows the games it supports to be played on platforms other than those for which they were originally released. To play games you'll need ScummVM itself installed on the PlayBook and original game files. Upload game files somewhere into the PlayBook, for example in the misc directory and add it in the ScummVM main menu. Please note that game files will be located in the misc directory. Right mouse emulation is pretty simple: on the left side of the screen there is a side bar where you can switch active mouse button. Since where is still no news on application approval, we've decided to upload bar file here. You can find download link in the first post. Got around to registering on your forum. As you have read on the crackberry forums, I would like to help out where I can. I am willing to beta test and give feedback. I really just want to keep this port moving along to the point it is in line with the webos port. Would you be able to share a list of features to be implemented and a possible priority? It would be good to know what you have planned before laying out bugs or needed features to get this port 100% complete. Also on an unrelated note, can you let me know how long the port took you to make? Keep up the good work. Playing SCUMM on my playbook right now. But I'm not really sure if this is handy. Then I'd like to change some default paths and implement more user-friendly filesystem navigation (browse only shared directory). It really doesn't take too much time to port. But porting has only just begun. We'll upload new release when it's ready. Those mouse gestures are for the non-trackpad control version. I found it much easier to use the touchpad version of right click. It is basically click and hold one finger where you would like to click and the bring down another finger to signify a right click. That also might be easier to impliment than all of the different timed values. 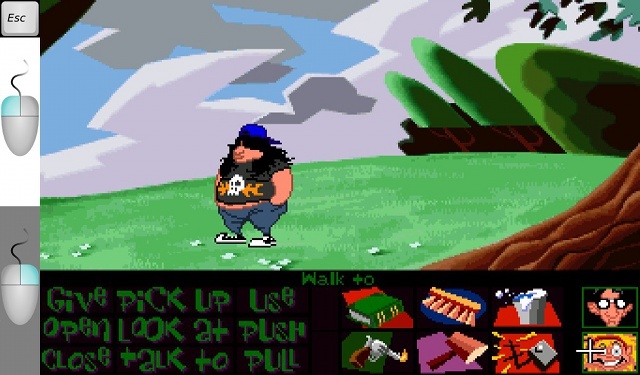 Also, is there any way to access the scumm menu after staring a game. That might be a good use for the downward swipe gesture. FYI, This page is currently the 3rd google result for "SCUMM Playbook"
It seems that you are using 2.0 OS. Actually, menu should appear on downward swipe, but something has changed in PlayBook 2.0 and it stopped working. This is already fixed in new version. Went back to 1.8 and sure enough the menu now works. You mentioned that this was fixed for os2 in a new version. Do you have plans for a release soon? What features do you expect to come out with the next build? New version is available in the first message. Found a bug upon install. The program icon is missing. I am on 1.0.8.6067. By the way CD games with FLAC sound amazing. I was almost getting used to the old midi based games there for a while. Thank you @Alexander Molodtsov for doing a great job, to port ScummVM on our PlayBook. I have a question ! Which OS do u use ? Because I've tried to put ScummVM on my 2.0.0.7111 but all games I launch, it comes back on the main screen (springboard) ! Which config do u use for the games ? I'm using 2.0.0.6149. Very strange, I don't remember any problems with 2.0.0.7111, though I didn't use it a lot. Have you installed 1.3.1 before? 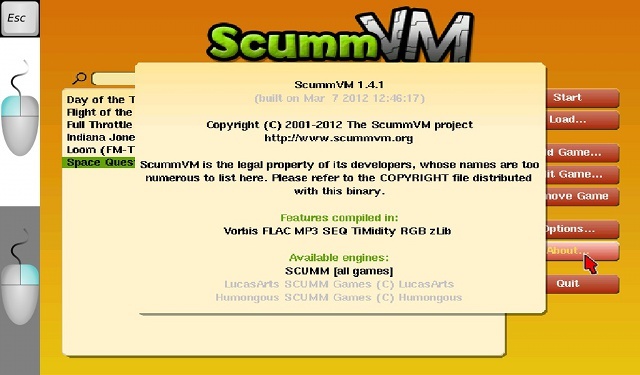 Try removing and reinstalling ScummVM. Any update on progress? I am particularly interested in how right click is coming along. That change would give the most functionality as there are a good deal of games that depend on it. supermew2001, I don't have possibility to test it on 2.0.0.7111 right now. This firmware is buggy so we don't use it. What games do you try to run? Zandengoff, unfortunately I didn't have time to work on ScummVM yet.